YOU REALLY ARE A MAGICAL GIRL, YOU KNOW? A stone door twice her height loomed ahead of her, cracked and weathered from centuries of aging. Elaine gulped, peering up at the symbols carved into its rough surface. Mundo, our student scientist, caught wind of a potential massive attacking happening on his home, the Virtupets Space Station. Upon hearing the news, he decided that he could not just sit idle and wait for the enemy to strike. He had to do something. 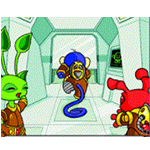 Last time, on Mundo Grundo vs The Alien Aishas Mundo, our student scientist, caught wind of a potential massive attacking happening on his home, the Virtupets Space Station. Upon hearing the news, he decided that he could not just sit idle and wait for the enemy to strike. He had to do something. He wanted to be a part of history and make a positive impact. So he chose to run out of his apartment pod, despite the station wide lockdown, and deliberately disobey the law in order to do something. "This is a LOCKDOWN. You are under arrest, you are not allowed to leave your pod. Since you can't obey that order we will put you in the pod prison to keep you in order." The Grundos then grabbed Mundo up and dragged him off. He was taken off to a jail pod, where he had all his emotions and anxiety wash over him. It all had taken a toll and left him exhausted, so he laid down to sleep. — — — — "Hey, get up," a sharp whisper cut through the silence and jolted Mundo awake. "Be quiet!!" "Wh-what? What's going...what's going on?" Mundo was clearly disoriented from being half asleep, and his brain was foggy. "The power went out, all the pods malfunctioned." Mundo's vision started to get a bit clearer as he wiped the sleep from his eyes and he could see it was the Acara inmate from earlier in front of him. Shocked, he backed up against the wall. "I'm on your side here kid, get it together," the Acara said. "The name is Petrina. Good to meet ya!" "Hi...hi Petrina. I'm Mundo," Mundo replied shyly. "Mundo the Grundo! What a name...geez your parents weren't doing any favors," another voice cut through, as the Lutari approached. "I'm Tyree. We're going to bust out of here now, you in?" "You can't just break out of prison!!" Mundo was not down for this plan, he was a rule follower and a good citizen, he didn't want to get mixed up in all of this. "It's either break out of prison and have a better shot at living, or wait in this cell for whatever is out there to come in here," said Petrina with a bit of anger in her voice. It was early morning in Terror Mountain, and snow was falling, as it so often did. It coated the already snow-covered landscape in a thicker white cloak, obscuring the view of anything else in sight. Ever wanted to know about the queen of Altador? Well this article is for you! For people with no patience or skill — to restock, but who can’t just sit and wait the bank to give profit, I’ll share my experience as a reseller and show your possible best path. Sometimes being a ghost has its perks, sometimes it has its drawbacks. 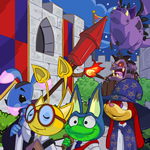 The plot achievements are a GROUP effort!